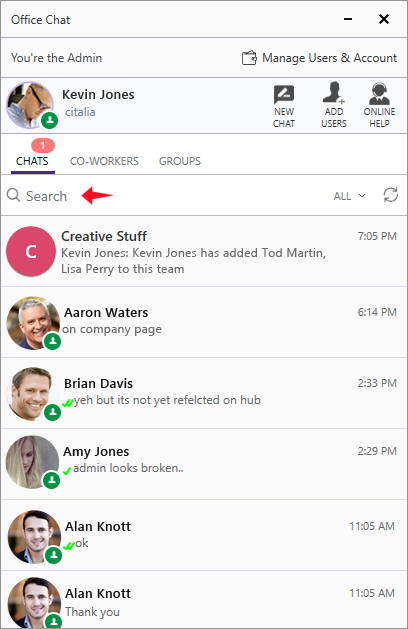 We are pleased to announce the release of Office Chat 2.6 for all platforms. This release includes the following new enhancements & improvements and is scheduled to go live between September 28th & October 5th, 2017. User Deactivation: When you deactivate a user, all his active sessions are closed immediately now, and the user is logged out ensuring that they loose access to all company data right away. 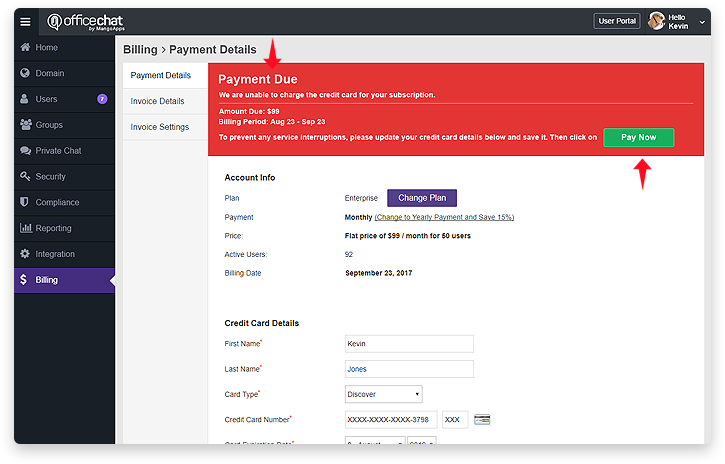 Option to Pay Now: In the event your automated monthly or yearly billing fails, you can now update your credit card information and use the new “Pay Now” to pay the amount that is due to avoid any disruption to your Office Chat service. This option to pay now is available during the 7-day grace period after the automated billing fails. Credit Card Expiration Reminders: If your credit card on our file has an expiration date prior to the next office chat billing date, then you will receive 3 email reminders – 15 days / 7 days / 1 day prior to the expiration of the card. Please use this email reminder to update your account with new credit card details prior to the actual billing date to avoid any service disruptions. 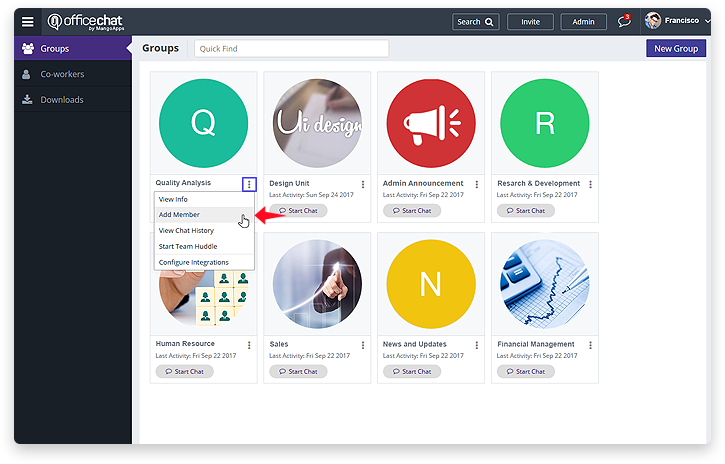 Quick Access Menu on Groups List: Primary actions on a group are brought out in the main list for quick access. 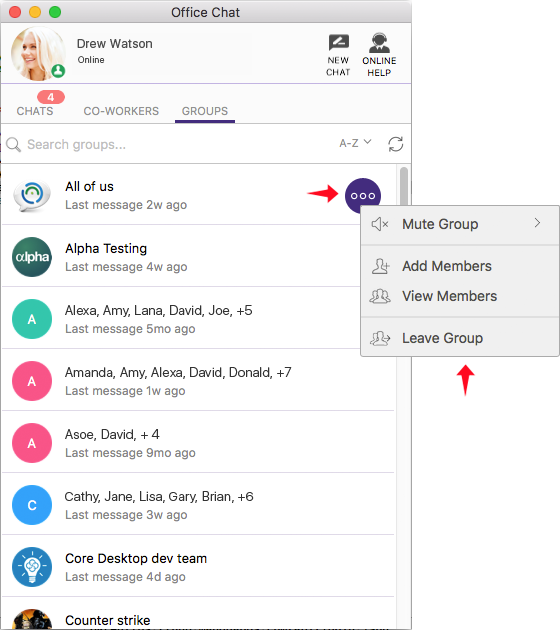 These actions include Group Settings, Mute Group, Add Members, View Members & Leave Group. Additionally, the UI for filter & sort options has become cleaner & clearer. 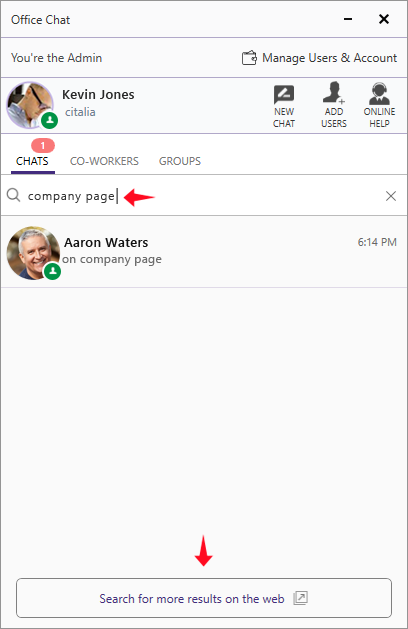 Co-workers List & Team Member List: The Co-workers list now shows an icon next to a domain admin user to help identify that the user is the admin of your domain. Similarly, in the group member list, you will see an icon against the group admins & domain admin in the team. Toaster Improvement: The chat notification toaster now shows the user image along with the username & message. 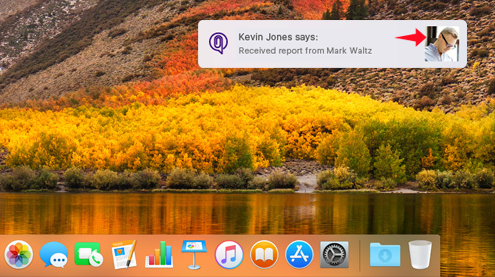 This feature is available on Office Chat Mac only. 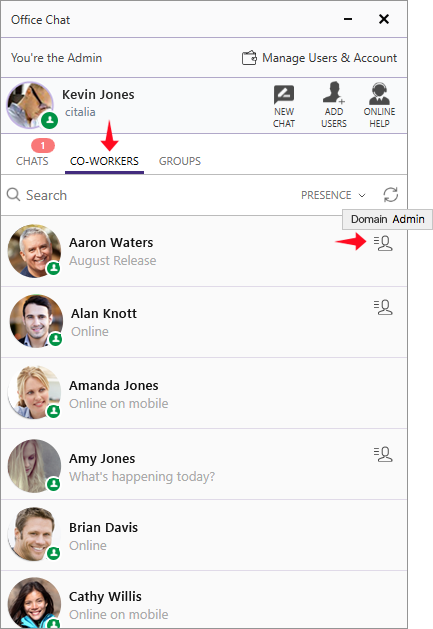 Multi-User Account Supported on Windows Server: If you have installed Office Chat on a windows server machine which has multiple windows user accounts, each windows user can now login into the office chat client using their own office chat login credentials. Talk Feature Improvements: Video player has been upgraded to a new version to provide a better UX and faster-playing performance. Chat Box Actions: All chat bar actions of talk, gallery, camera now require a single tap to switch from one to another. 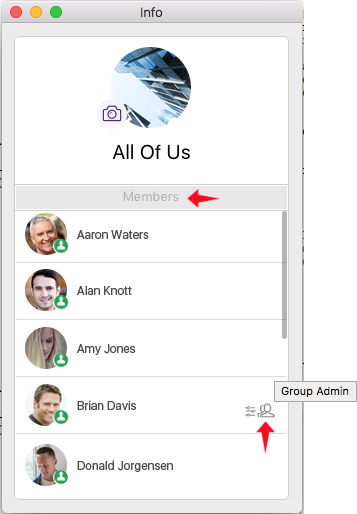 Ability to Add Members to a Group: You can now add new members to a group from the Groups list in the web portal (like you’re able to from all other office chat clients). 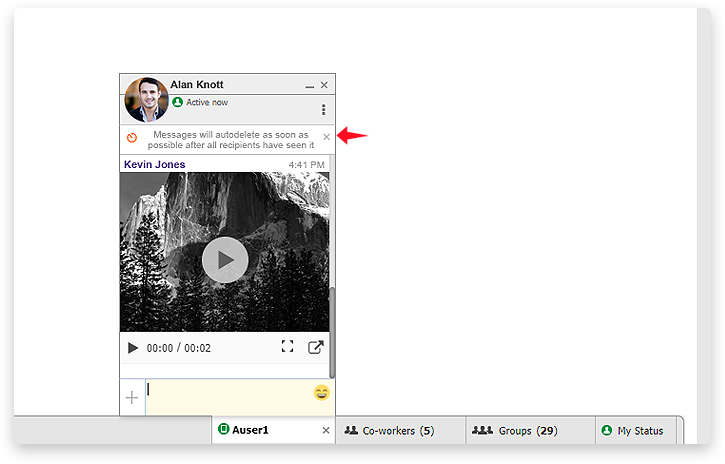 Self-Message Sound/Vibrate Issue on Mobile: If you’re logged into Office Chat from two platforms (e.g., Windows desktop & iOS), and you send a message from windows desktop in a group, then your logged in session on your other iOS device also used to get a sound / vibrate notification. 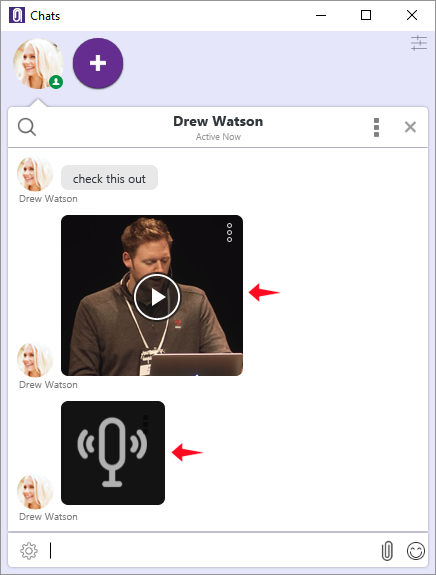 This issue has been fixed in this release, and now for self-messages, you won’t get notified (sound or vibrate) on your mobile device; however, the message will still be silently updated in the chat history in real time on all platforms. Talk Player UI on Older Android Devices: The talk player UI on Android devices (version < 5.0) has been fixed in this release. Web Video Playing Issue: At times after closing the video or audio preview in chat, the video/audio used to continue to play. This issue has been fixed in this release. Reset Password Issue: In an AD/LDAP authenticated domain, the change password function is no longer available now. To reset a password for an AD/LDAP authenticated domain, please get in touch with your admin to reset your password using the AD/LDAP admin console. Date Issue in Email: The email notification for the successful annual billing used to have the date incorrectly mentioned. This issue has been fixed in this release. Update Credit Card Link: The link to update your credit card details in case of billing failure did not take you to the exact page to update the CC details. This issue has been fixed in this release and now clicking on the link in your email, you would be re-directed to the credit card details page after a successful authentication.